I am thrilled and grateful to have the opportunity to write a column for each issue of Planet Kansas, our local Sierra Club newsletter. This article appeared in the December, January, 2011 issue. The holidays are upon us. Decorations have been up for a while now—reminding us of the countdown and the coming excitement. It is an interesting time for environmentalists and others who are working to heal the world. It’s such a mixed bag. On the one hand, we are entering a time that is loaded with tradition, family expectations, and a huge emphasis on consumerism. As would-be earth rescuers, we have to look at cherished traditions that may hold good memories for us—and question them. How do these traditions affect the earth? What sort of pollution is produced by the extra travel; the lavish decorations; the buying of gifts made in China and transported here; the landfills bursting with non-recycled wrapping paper, bows, and broken toys; and all that food? On the other hand, we want to enjoy the holidays along with everyone else—most of whom would rather we not remind them of the environmental consequences of our holiday behavior. But environmentalists are visionaries, looking forward to how we can create small green footprint holidays in harmony with nature. It is never more obvious that we are standing with one foot in the old paradigm and one foot in the new than at holiday time. We walk the razor’s edge as we quietly swipe the wrapping paper out of the giant red plastic trash bag and hide it in our car (or bike) to recycle it later. Of course we don’t want to “spoil the party” by loudly announcing the eco-sins committed by our 95 year old uncle Cedric. Instead, with our actions more than our words, we can be a peaceful, joyful example of how to start a new tradition of a green, organic, fair-trade, nonviolent , peace-promoting, earth healing holiday season. 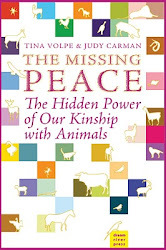 Of all the things we can do to promote this new tradition of true peace for people, animals, and the earth , the most far reaching action we can take will be what we choose to put on the table. All over the world the various year-end holidays echo the universal human longing for peace. Yet the meals of age-old traditions tend to be loaded with the meat, dairy and eggs of animals who have certainly not lived or died in peace. Over the centuries such meals were symbols of wealth and power. For many of the world’s poor, a meat laden meal symbolized a reprieve from poverty. That has certainly changed in the U.S. where animal products now make up the bulk of American diets and waistlines regardless of one’s wealth or lack thereof. The Center for Disease Control and Prevention reported recently that only 10.6% of Kansans daily consume the recommended two or more fruits and three or more vegetables each day. The highest percentage was only 20% in D.C. (AARP Bulletin, November, 2010). Good for McDonalds. Bad for us and the future of life on earth. It is during these holidays that “Peace on Earth” somehow becomes a shared dream, a hope, something that, at least for now, we can believe in and celebrate the possibility. Yet when we take even the briefest of looks at animal agriculture in the world, we could not help but call it “hell on earth”—not just for the farmed animals, but for the land, for wildlife, and for our health and the health of our children. It is up to us to stop this agricultural engine of destruction, and we can. Of all the environmental challenges we have, this is the simplest to solve. It’s a matter of choosing non-animal food at every meal. Here is that brief look at the rampant devastation caused by the animal food industries. Air Pollution: By now you have heard about the 2006 United Nations Food and Agriculture Organization’s conclusion that animal agriculture contributes more greenhouse gases than all the cars, trucks, planes, and ships in the entire world combined. Also animal waste produces 80% of the ammonia emissions in the U.S., according to the EPA. Water Pollution: The Audubon Society reports that over half of U.S. water is used to raise animals for food. The EPA states that animal agriculture excrement pollutes more water sources than all other industries combined. While human beings have sewage systems, animal farms are not required to have them. Instead, the manure and all its accompanying bacteria, drugs, and other contaminants fester in open air lagoons, percolate down into the ground and overflow during heavy rains. Of course, water pollution from slaughterhouses, tanneries, and fertilizer and pesticide industries add to the poisonous mess. Poor Land Use: The USDA reports that 80% of agricultural land is used either to house animals or to grow their feed, and the Food and Agriculture Organization estimates that 30% of the earth’s entire surface is used for livestock. Approximately 70% of grain grown in the U.S. is fed to animals—enough grain to end starvation worldwide. Deforestation : The FAO considers animal agriculture a major cause of deforestation as huge companies take over tropical and other forests from nature and indigenous people, clearcut the trees, and either grow grain for animals or run cattle on the eroding, damaged land that remains. Decimation of Wildlife: The UN reports that such deforestation has caused the extinction of many plant and animal species in rainforest areas. Wildlife Services of the USDA, which is charged with protecting livestock from predators in the U.S. used taxpayer money to kill 1,642,823 animals in 2006 alone. They use steel jaw leghold traps, shooting from helicopters, and poisoning, among other cruel methods. Fishing Hurts: It hurts the fish who are sensitive and intelligent beings, but also, because of drift net and other massive, industrial fishing techniques, the coral reefs and the oceans themselves are being devastated. Clearly, the most powerful action we can take during this holiday season and into the new year is the mother of all boycotts. The adoption of a vegan lifestyle, which is synonymous with nonviolence, and includes an animal-free diet, is the most effective tool any environmentalist can utilize. As we continue our mission to reverse the destruction of our precious jewel of a planet, and create a new paradigm of tenderly caring for our earth home, let us make this holiday season one of hope. We can teach and foster new human traditions that reflect real joy and peace, reverence for all life, and a deep awareness of our sacred connection to the earth and all who live here. Thank you, anonymous, for your wise and thought provoking words. And please, everyone, do visit those great websites to learn more. www.veganvideo.org and www.tryveg.com. 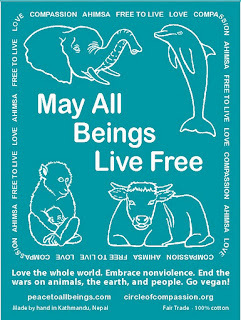 Blessings to all as we journey toward a world of kindness, compassion, peace, and love for all beings.